Recently, I got a note from ceramic artist and art teacher Wendy Shirran. In collaboration with designer and illustrator Veselina Tomova, she is working with 22 Grade Three students in Paradise NL to create a series of ceramic relief tile murals based on a traditional Newfoundland folk tale, song, or poem. Wendy was looking for a story about selkies, mythological creatures who live as seals in the sea but discard their skin to become human on land. While the stories are popular in Irish, Scottish, and Faroese folklore, selkies are not a common part of the folklore of Newfoundland and Labrador, so I suggested a mermaid story instead. 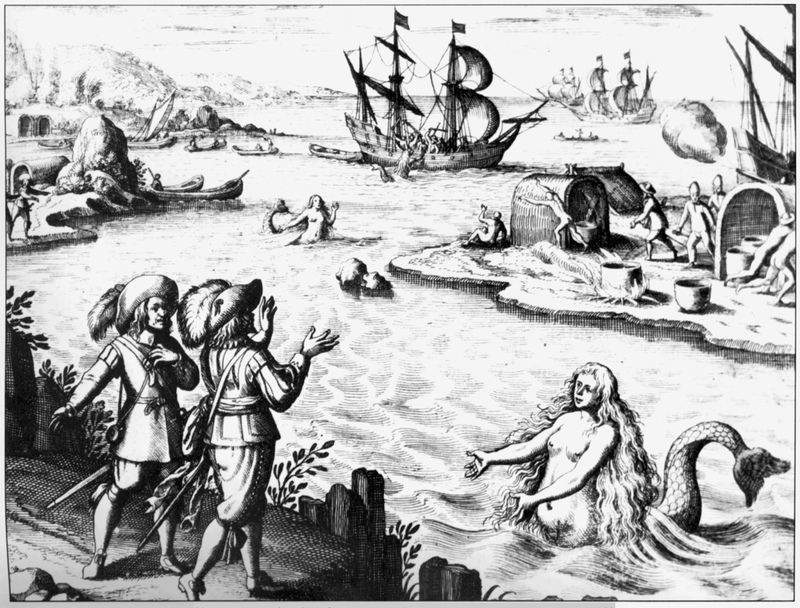 Mermaids have a long history in this part of the world, though the stories often do not end happily ever after. I took a couple different versions of traditional Newfoundland stories and put them together, hopefully in a format to inspire a new generation of young ceramic artists and designers! My story is below, and you can download a pdf version here. Once upon a time, there were two mermaid sisters. They lived in a place called Beachy Cove, in Conception Bay, not far from St. John’s. The sisters were very beautiful creatures, half woman and half fish. From the waist up, they looked like human women. But from the waist down, they had long tails like fish. Their faces and arms were lovely, and they had long blue hair hanging down their backs. The mermaids would rest on the beach at night and comb their hair. With one hand they would comb out their long blue hair, all the while admiring themselves in the mirrors they held in their other hands. One night, a fisherman went for a walk along the beach. As he walked along, he saw two mermaids sitting on a rock as plainly as he ever saw anything in his life. He tried to get closer to get a better look. But as he did, he kicked a pebble and it clattered along the stones, making a noise. The sisters heard the noise, and were startled. They turned, and saw the fisherman. Then, with a splash of water and a flick of two great fishy tails, the girls dove down to their crystal caves below the sea, and were lost to sight. From that day on, the fisherman went back to the beach, hoping to see the mermaids. Eventually, the sisters became curious about this man who came every day. When the fisherman would go past in his boat, they would come up by the side of the boat and talk to him. These mermaids were the daughters of the sea and would bring him both good luck and bad luck. The older sister was bad and would cast magic spells to play tricks on him. But the younger sister was good, and would work her magic to cancel out the evil of her sister. One day, the older sister used her magic to sing up a great storm. The fisherman’s little boat was caught in huge waves, and was about to crash into the rocks. But just when it looked like the fisherman would die on the rocks, the good mermaid appeared, climbed over the side of the boat, and steered the boat safely through the waves to the shore. After that, the fisherman never saw the mermaids again. But he lived to be an old man, and told his grandchildren about the two sisters, and how the good sister had saved his life. And now it is your job to go and tell that story to someone else. Adapted from several traditional Newfoundland mermaid legends by Dale Jarvis.